A line of English text starts at the left-hand side and is read from the left to the right. Arabic runs in the other direction: the text starts on the right-hand side of the line and reads on to the left. Arabic text must be typeset to reflect this: text that is left aligned in English should generally become right aligned in Arabic. In fact, the whole layout must reflect this directionality. In a 3 column page of Arabic text, the first column starts at the top right of the page. In a text table, the first column is the right-hand one. If you are converting an English layout to Arabic, graphics and pictures may also need to “flip” to preserve the sense and reading order. One extra complication for the unaware is that numerals within Arabic text read from left to right even the text around them reads from right to left. Neither Adobe InDesign nor Quark Xpress as they come “out of the box” allow you to typeset Arabic. Both require plug-ins or specialised versions. For many years, the Quark Xtension “Arabic XT” was the standard although required some finesse. The original version was pre-Unicode but a newer version is much improved and supports Unicode. That said, InDesign now rules the roost when it comes to Arabic typesetting with a host of scripts and other options available. For “industrial strength” Arabic typesetting, InDesign ME is probably the pick of the bunch. The program is a completely separate version of InDesign tailored to Middle Eastern languages, provides good support for Arabic, Farsi and Urdu (in CS5), and has helpful page “flipping” features. Middle Eastern versions of Illustrator, Photoshop and Dreamweaver also exist: in fact you can buy Creative Suite ME. When typesetting a line or two of Arabic, there may be a temptation to just paste the text into InDesign and hope. This can lead to the embarrassment of sending your client gibberish. Job done? Absolutely not. The text above is disastrously wrong. The letters are in the wrong order. Even if they were re-ordered, the letters are incorrect forms. Each letter in Arabic takes a different from depending on whether it is isolated, at the start of a word, in the middle of a word or at the end of a word. Any diacritics will also be incorrectly positioned. If you are placing some Arabic typesetting and it looks like early graphics, you need to re-think. If your text looks like the later examples, you are on the right track! Numerals in Arabic can be written in two ways. The symbols used for each number often referred to simply as “Arabic numerals” (or “Western Arabic”) are the same as English, while “Hindi numerals” (or “Eastern Arabic”) look different. Which is appropriate depends on factors such as the purpose of the document, the type and location of the audience, etc. Whichever form the numbers are written in, they always run left to right. Both Mac and PCs provide some basic Arabic fonts, such as Geeza Pro and Traditional Arabic. (NB there have been some reports of font embedding problems with the latter). Winsoft provide a decent Naskh typeface with InDesign ME, and this is a good starting point for a body text font. Beyond that there are large number of fonts available, both purely Arabic ones and fonts built specifically to match an English typeface. Font foundries such as Lintotype are a good source of vast arrays of Arabic fonts. … get someone else to do the hard work! If all of this doesn’t fill you with excitement at exploring the unknown, you don’t want to learn about different paragraph composers, kashidas, compulsory and discretionary ligatures, Naskh and Thuluth scripts, then shame on you! Seriously though, sometimes a job just needs to get done quickly and done right. In that case, there are plenty of firms out there that will do your Arabic typesetting and send you back high resolution PDFs or outlined text in InDesign. Just google Arabic Typesetting, but don’t forget to look at our advice on getting the best rates for multilingual typesetting! If you are doing it yourself, and run into difficultly, add a comment below and we’ll see if we can help. (Please don’t comment just to promote an Arabic typesetting service or product you are selling – your comment will not get approved). You’re not the first person to hit the problem of not being able to have both the “normal” and ME versions of InDesign installed. I’ve even known people set up two partitions with separate system installs to get round this. But, I take my hat off to you for taking the bull by horns and coming up with this solution! In InDesign CS5 you can actually typeset arabic text in the normal version, but only via the scripting interface and not via the UI. What is the setting in InDesign ME CS5 to apply to basic fonts and settings? We have imported Arabic from an XML file into InDesign and now we are having trouble formatting it. Any help would be appreciated. That should get you under way. There are various other nuances (which digits to use, ligatures on or off, etc) which can be controlled from these same two palettes, but the “correct” settings of these depend on your project. Don’t forget that, as Arabic reads right to left, you will need to reverse your page layout from its English layout. If you want to discuss a specific problem (or show me a screengrab to see if it looks right), comment again and I’ll email you. I’m having trouble when pasting arabic text from word into indesign, numbers are displayed reversed, as well as english words withing the text. In design is reading them from right to left like the rest of the arabic text. Is there any way i can fix this instead of doing it manually word by word? Hi Stephanie. Are you using InDesign ME or one of the plugins? I am assuming you must be, and your Arabic itself is appearing correctly – from right to left, with the letters joined up – as in the later examples in the blog article. If so, you should be able to fix this by changing the character direction from “Right to Left” (or “RTL”) to “Default”. This latter setting allows Arabic characters to run right to left while English and numbers runs left to right. In InDesign ME, you will find this setting in the character palette’s drop down menu under “Character Direction”. If that doesn’t fix your problem, could you let us know more details about your InDesign set up so we can try to help further? I’m having the same issue. I’m using regular InDesign CS6 and I’m trying to copy Arabic text from a Word Document and put it into InDesign. The document still has some English text and when I copy it into InDesign seems to appear correct but some of the punctuation is in the wrong place or it will shift some of the Arabic text around the English text, so it won’t be in the correct order. I’ve discovered the plug-in World Tools Pro but wasn’t sure if this would fix my problem. 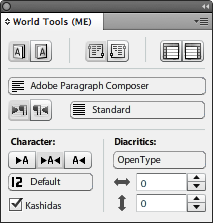 I’ve changed the the language and font to Arabic and the paragraph style to Adobe World-Ready Paragraph Composer but its still not fixing my problem. Hi Leigh. This may be a daft question but have you set the paragraph direction to RTL as well as changing the composer? Once this is done punctuation should mostly be correct with only exceptional marks requiring a manual directionality to be set. Let us know if you still have problems? I just downloaded Scribedoor from Winsoft which is an Indesign plugin for the Western version rather than the full Middle Eastern program (Winsoft told me it’s not a good idea to have both installed on the same computer). This seems to be working fine so far, just wondering if anyone has any experience of “right justify” Arabic text? Meaning that the last line isn’t forced to take up the full width of the column. Native Indesign can of course only left justify text. sorry please ignore – of course there is a right justify option in indesign! Ah, yes! I was just about to say that, so hopefully you won’t have any more problems. Now working with tabs to different alignments in Scribedoor – that I’ve found more tricky. I’m having trouble with the direction of digits in combination with text (my client wants me to use Arabic digits). I can change all this manually. Any idea if I can get this text imported correctly, so I don't have to make changes? Hope it proves the same for you. Yes, that can be a useful script so long as you check the results and don’t mind not being able to alter settings “on the fly” through a panel. Something that remains unclear to me is just how much Winsoft have tweaked the underlying composer in the InDesign ME release. On occasion, I have seen differences in the results obtained between using this kind of workaround in InDesign and using InDesign ME to set. I have translated a book into Arabic and the publisher wants it set according to a ready layout he has. The layout is of course “left-to-right” including drawings. Is there a way I could reverse/mirror the existing book layout from LTR to RTL so I can then just insert the Arabic text instead of the Western one? @Tarik: This should be possible. However doing it well may require the publisher to engage a typesetter with some knowledge of Arabic and the correct software. It rather depends on what budget (if any) is available, and what software the publisher uses. If the “Western” layout or template is set using Quark Xpress or InDesign, it would be a relatively straightforward job to use InDesign ME (Middle East) to “flip” the layout so the pages and drawings appear in the correct order. Try googling something like “arabic typesetting services”. I’d be happy to help if you need more advice on how to go about this. Feel free to leave another comment or email via the contact form. This page is very interesting, thank you! You might be able to help with a problem that I have. After being translated in a CAT tool from English into Arabic, the target file shows the text in the wrong order. Words are correctly typed, with ligatures and correct order of characters, but the order of words is inverted. For example, first line in the letter should show زميلنا العزيز (our-client the-dear) but it shows زميلنا العزيز instead. Does any possible reason come to mind? Are there any measures that can be taken so that this problem doesn’t happen? I can see the language of the document is English. When I change it to Arabic in Proofing tools (Word 2010), it stays the same. @Manuel. Thanks for your comment. In Word, it sounds as if perhaps right-to-left languages are not enabled, or the right to left paragraph button is not clicked? Word will order Arabic incorrectly if it thinks it’s composing a left to right paragraph. Try the steps outlined in this Microsoft article: Right-to-left language features. This should get Word behaving correctly, and may get the CAT software to order words correctly too. I have had problems with some CAT software with word order, and ended up reviewing text in Word or directly in the InDesign layout. By the way, as you mention a CAT, I’m assuming you’re working on a PC rather than a Mac. Arabic support in Word is in experience far better on the PC than the Mac (sadly). I was wondering if you could help me out with a problem I have, basically I have created a multilingual document English and Arabic and Im fairly new to indesign, the problem is that I’m not using the ME version for the arabic part just a script that lets u paste in the arabic text properly by creating a paragraph style, thats all well and good, however I need to create a reverse layout of the arabic part aswell as the page numbering, to start from number 1 but from the last page, is this possible? I have been given a Word doc with Arabic copy where the paragraphs run from right to left. However, the STORY runs from left to right, just like an English language document. So: the document starts (at its most leftmost end) with page 1. In the printed publication, page 1 needs to be at the most rightmost end. How do I get the story direction right? And where? In the source file (Word), in InDesign, or even in the pdf document? I have Word for Mac and InDesign CS5.5 with World Tools installed. @Karin: first, I would caution against using the Mac version of Word to look at Arabic. In my experience, it’s best to use PC Word if you have it available. (This is about the ONLY circumstance I advise using a PC over a Mac). If you don’t have PC Word, ask your translator / client to send a PDF of the text for reference. Sometimes, TextEdit may be more helpful as a fallback. I suggest always importing the text into InDesign, rather than copy and pasting from Word. Regarding story direction, you can alter this section by section within Word. But you should not need to worry about this if you are bringing the text into InDesign. The important issue is to have the correct direction within InDesign. I use the full ME version of InDesign (rather than this plugin) which has a “Reverse Layout” option to help create a design that flows from right to left. I am not sure but I think with World Tools you might need to rearrange some of your page elements by hand. Once everything is correct in your InDesign layout, any PDFs produced from it should also be ok.
Hope this helps … Let us know how it goes or if you run into further problems. Thank you! I will set to work… In place of PC Word, would you say TextEdit or (iWorks) Pages is the better option? My experience is that TextEdit composes Arabic text pretty well, so I’d use that to look at text if you cannot use PC Word (or get a PDF produced from it). Thanks! I tried TextEdit unsuccessfully for some reason (text came out as gobbedigook) so will try the Windows Word/pdf route! That’s very odd – as TextEdit is usually quite good for Arabic text. I wonder if your translator has used a very old, non-Unicode font? All the more reason to check a sample page early on in the process to ensure there are no conversion problems. Hi again, and thanks again for being so helpful. You shouldn’t need to do that ASSUMING your printer understands Arabic imposition (plenty do). If you are worried, send them a dummy – or ask for a wet proof. I would not recommend using “backwards” pagination where the first spread in InDesign is the final spread for the Arabic reader. This is far more likely to lead to confusion in my experience – and means any PDF proofs will be backwards. If you do, then actually you’ll most likely need a left spine … because you are doing everything backwards. Try a mock-up with a printout and you’ll see what I mean. But it really is best to use a correct set up with a right hand spine, the first spread in InDesign being the first spread for an Arabic reader, and for the printer to use an Arabic impo. Thank you! Very useful advice. The fact that I don’t have to do everything backwards like I thought makes my life much easier! I’m currently working in an Arabic speaking country and will be working together with an Arabic-speaker whose task it is to check that I don’t mess up! I also just took out a Lynda.com subscription to watch “Typesetting Middle Eastern (ME) languages”, which seems to come with a lot of useful info. I’m still slightly confused re binding and page order and this is because the publications (this, and others to follow) will also be published online as a pdf so not sure yet how to deal with that bit. You should be fine with the PDFs. The correct approach is to set the spine to the right (i.e. a spread is numbered [3..2] rather [2..3]) as you have done, but not reorder pages (i.e. leave first page as page one, etc). (Of course, the layout of objects on those individual pages needs to flip so the first object within any given page is on the right hand side). Thanks for clarifying the pdf page order! Thanks to your helpful answers I have nearly nailed this now. This is hopefully my last question: In my InDesign document the text flow goes like this (think spreads): Right page, LEFT column, then right column, then left page RIGHT column, left column, then next spread’s right page LEFT column etc. (I can send a screenshot if this doesn’t make sense.) This is wrong, no…? Should the story not run Right page: right col, left col, then left page, left col then right col? I selected the whole story and set the paragraph and story direction from right to left. Not sure if I needed to do something else? Eureka! I think I worked it out myself: When I autoflowed the document I had (out of habit) started the flow off in the right column, not the left, and this is what caused the incorrect order! I meant the opposite. I had started it off in the left column instead of the right. Sorry. ie Right page: right col; then Right page: left col; then Left page: right col; then Left page: left col.
I’m having trouble too, when pasting arabic text from word into indesign, numbers are displayed reversed. I’ve tried fixing it by changing the character direction from “Right to Left” but didn’t succeed. I’m using InDesign Cs6 Version 8.0! Sounds strange: what’s the context exactly? Are these numerals within a flow of text? If so, they should appear left to right. If it’s a phone number you might need to apply a LTR direction over the whole thing. If it’s section and subsection numbers, you might need an RTL direction on the divider. Finally are you sure the number is typed correctly in Word? Try scrolling through it one character at a time. Sometimes translators type numbers backwards to make them APPEAR correctly in Word – in which case re-type them. very helpful article but i was actually searching for Arabic ligatures/symbols/phrases like ‘Subhanahu wa Ta’ala’.. jst to share my exprncs..for those like me..
the same as above but Adobe Naskh> radiyallahu anhu and alahissalam..
havnt found Jalla jalaluhu or sbhanahu …mining goes..
Nahlah, hope your continuing search goes well. Let us know which fonts you find most useful for supporting these phrases and glyphs. Adobe Naskh seems a good option, but is not the whole answer. For more calligraphic situations, you might consider the AGA Islamic Phrases font? Is it in Indesign possible to layout two parts, one in English and one in Arabic in the same document, so that the English part begins at the left-most page and the Arabic in the right-most page. So both ends of the parts are in the middle of the document. Imagine there is a document in Englisch and its translation in Arabic and both are published in the same book. Page one is the begining of the English document and the last page ist the begining of the Arabic document. Im using cs6 indesign. Im trying to type,change font arabic naskh but i couldn’t. i can only use glyph to solve the arabic typing, but to slow.. i need to click so every single alphabet to settle my arabic. How to use font with just key using in keyboard without used glyph. Can any body help me.. Previous Previous post: Multilingual typesetting advice, tips and how to’s coming up!